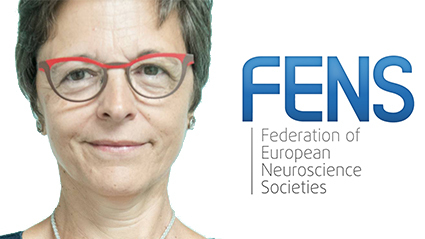 The Federation of European Neuroscience Societies has appointed EPFL Professor Carmen Sandi as its President. To pursue these research objectives, Professor Sandi’s lab combines behavioral, neurobiological, neuroimaging, neurochemical, pharmacological, metabolic, genetic, and optogenetic methods. In addition, they also carry out translational studies in humans using virtual reality, behavioral economics, experimental psychology and neuroimaging approaches. The Federation of European Neuroscience Societies (FENS) was founded in 1998, and is now the main organization for neuroscience in Europe. FENS currently represents 43 European national and single-discipline neuroscience societies and counts almost 23,000 members from 33 European countries. The mission of FENS is to “advance research and education in neuroscience within and outside Europe,” and “to facilitate interaction and coordination between its members.” As such, FENS promotes excellence in neuroscience research and facilitates the exchange and networking between neuroscientists within the European Research Area and beyond.